The impacts of Brexit, stamp duty reform and mortgage regulation have all created a low transactional environment in the housing market, which both buyers and sellers have had to adjust to in recent years. 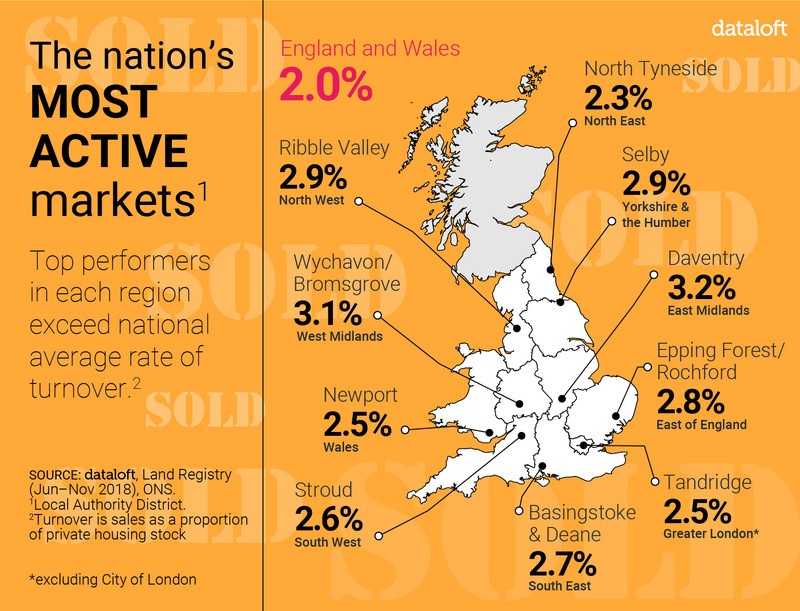 During the second half of 2018* the average rate of turnover (sales as a proportion of private housing stock) across England and Wales stood at 2%. However, there are markets which are more active. We assessed the rates of turnover for every local authority and have highlighted the top performers in each region. Each exceeds the national average and appears to be located in more affordable locations in their region and/or areas of new housing supply. Daventry in the East Midlands has the highest rate of turnover of any LAD (local authority district) across England and Wales at 3.2%, followed jointly by Wychavon and Bromsgrove both in the West Midlands at 3.1%. The highest rates in London and the South East are the relatively affordable commuter locations to London of Basingstoke and Deane (2.7%) and Tandridge (2.5%).